I have just arrived safely back home and immersed myself in the daily struggles of my working life. Ever since I left Regina Laska I felt the urge to write this email, with the emotions of last week still pumping through my veins. 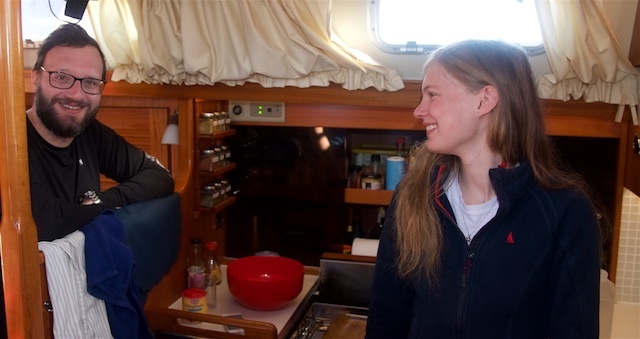 Leaving the boat, saying goodbye to Chris first, then to Tom, Patty and Leon at the boat and finally to Jessica at the bus stop left me with a sense of sadness and emptiness that I did not feel since a long time. 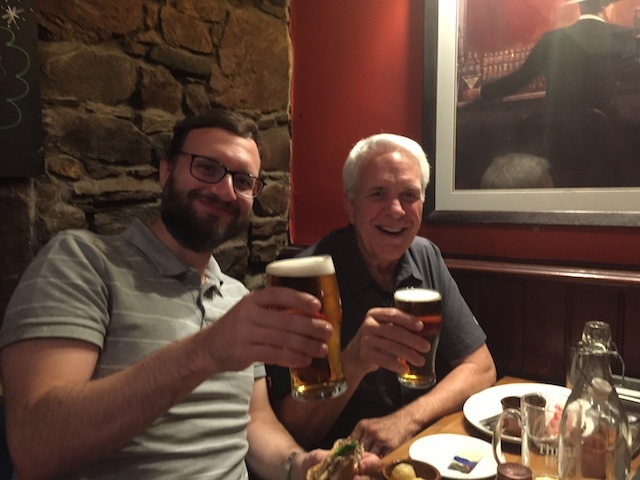 My last beer in Inverness before casting off to cross the North Sea. Here with my crew-make Tom from USA. I’m not a sentimental person but this time it was different. On the trip back I tried to rationalize these emotions and here I am writing about one of the best weeks of my life. Let me start with the amazing experience that the trip was. 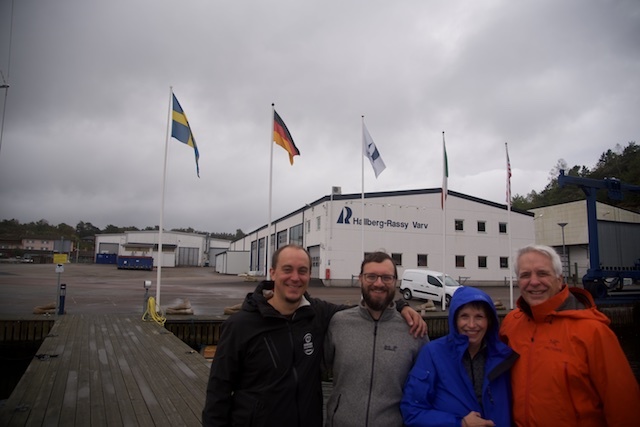 First a rough sail in the middle of a treacherous sea, then the relax and the beauty of the anchoring spots, later a social crossing to Orust all topped up by an interesting visit to the Hallberg-Rassy yard in Ellös and to the great “Carl-berg Rassy” Adams in Vindön. What a great mix to pack in a single week!!! But as much as the trip was interesting, it was the crew that really made it special. As usual, you, Leon, managed to excel in what I consider your best skills: the ability to pick up crew members that would fit together and the great care and attention you pay to ensure their experience is as best as it can get. You are a true master of this and I really noticed this time your attention to details and your sensitivity on the matter. 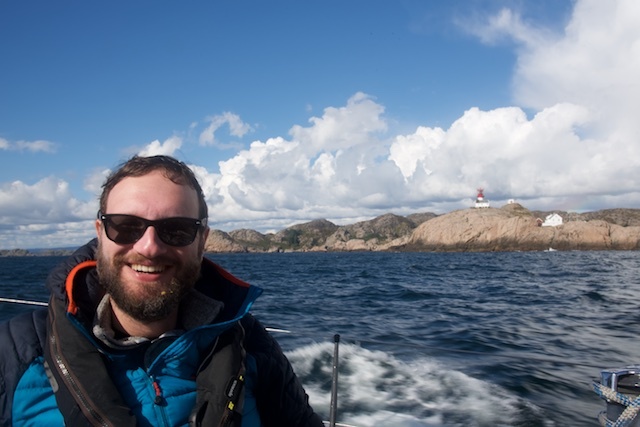 Navigating the challenging archipelago of Norway. 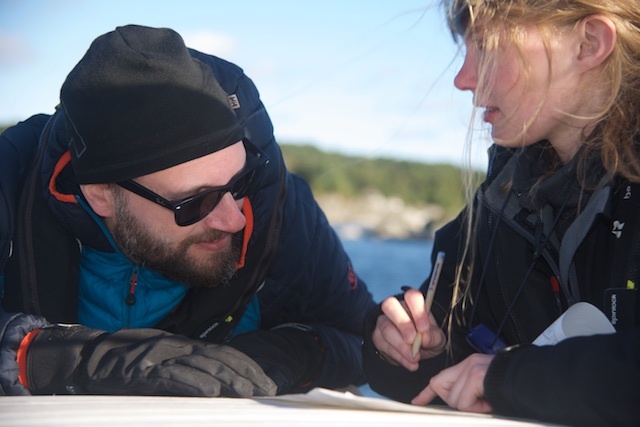 The RYA must excuse us having the chart on deck, but there are so many islands so close by – By the time one would run up and down from the chart table, you are on the rocks! 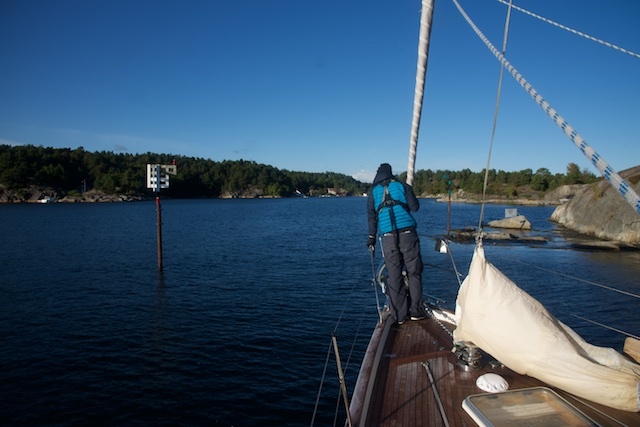 This is Scandinavian sailing! 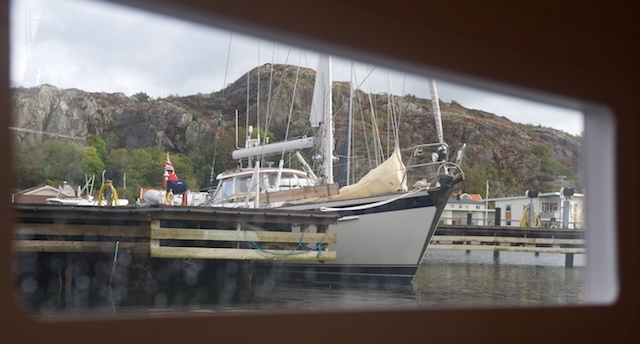 Checking if we will make it through the Blindleia in Norway… For sure, this is narrow! 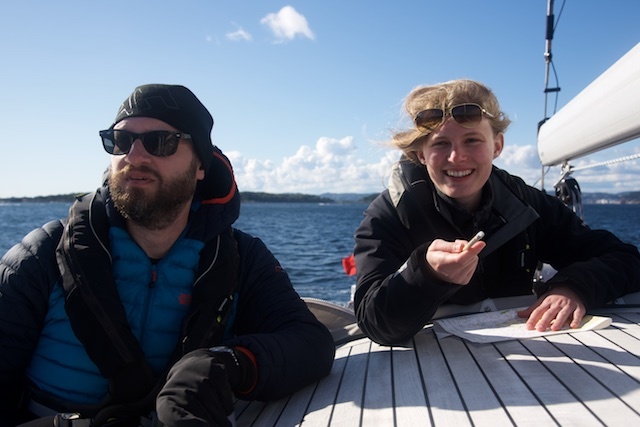 This is so much more than just sailing! It’s the psychology behind and the people I share it with that makes the difference. A “dip” in the cold Skagerrak after the warm sauna onboard. Christian (right) and me did not wish to look worse than the vikings! Nothing is left to chance in your careful preparations of every minute of the cruise and all your efforts are geared towards the social aspects of it. No one is left behind, everyone is taken care of and, most importantly, everyone has time for himself and for great conversations and laughs together. 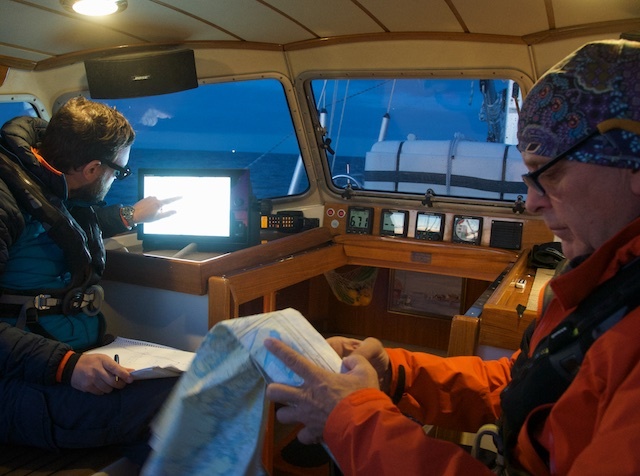 Preparing night entry through the archipelago to Kristiansand, Norway – with electronic navigation as well as classic with the paper chart. 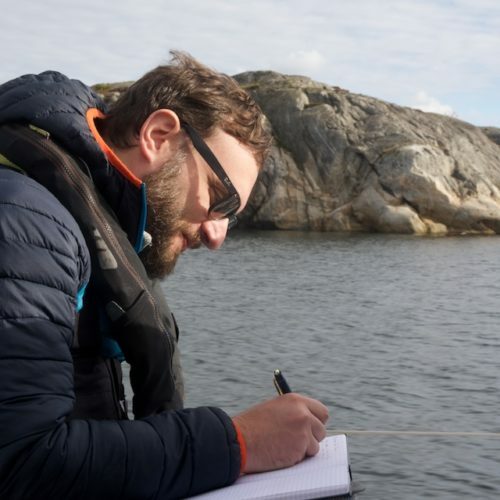 Taking notes of all I learn while sailing on Regina Laska. There so much information, but the pleasant thing is that it all feels so natural and never complicated. 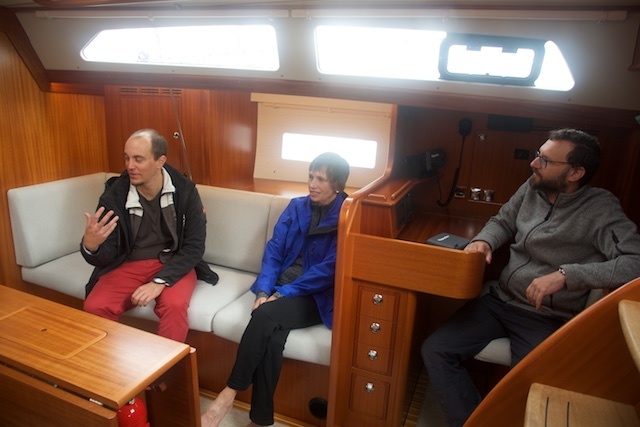 Sailing comes as a matter of course with such a wonderful crew! 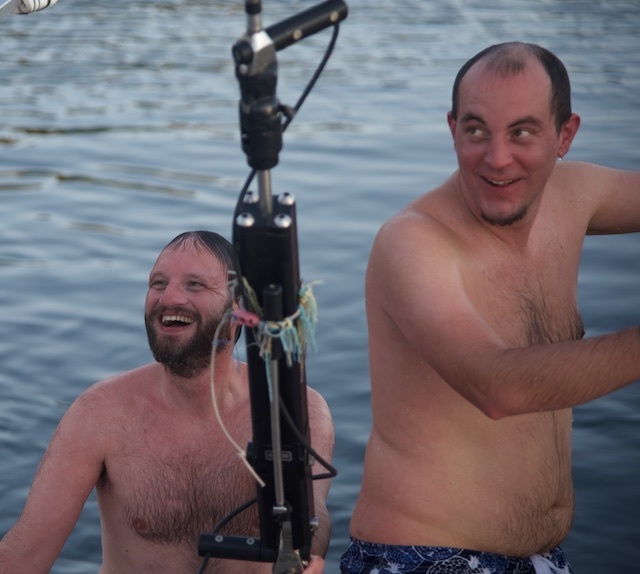 This multitude of shared experiences in the variety of situations we faced, really created a special bond with the crew. A bond that, as I said before, I did not feel since a long time. 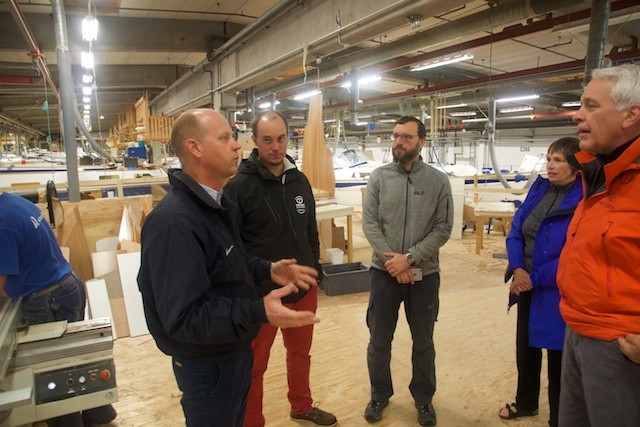 The visit at the Hallberg-Rassy yard. They had even hoisted the corresponding flags: German (Christian), Italian (for me!) and American (for Tom and Patty). Very cool! 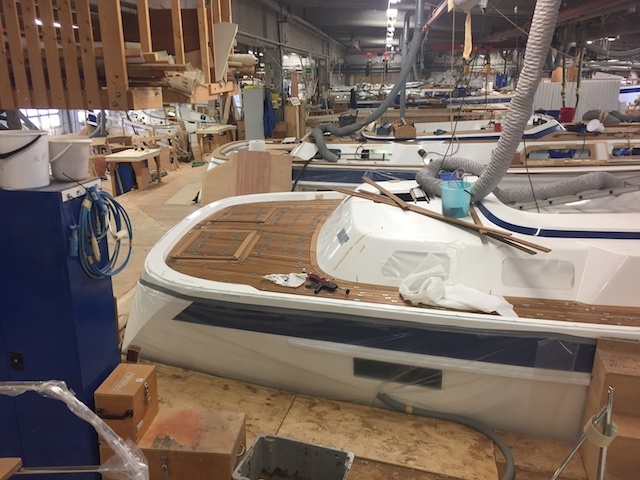 This is where the every new Hallberg-Rassy is born! Being guided through the yard by sales manager Magne. 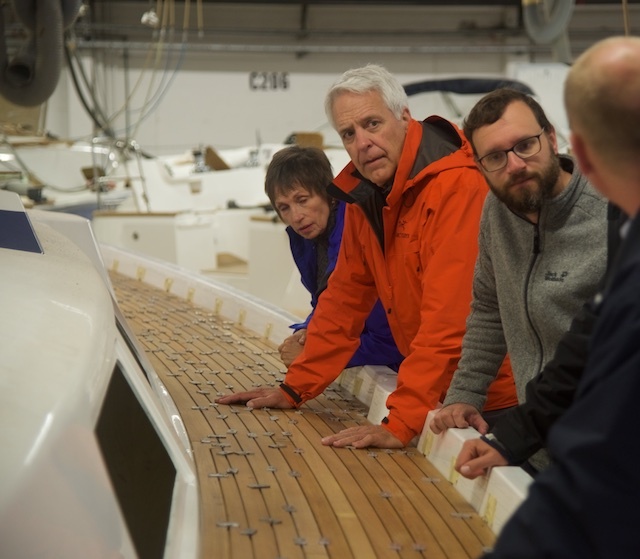 Understanding the high building quality of a Hallberg-Rassy. Seeing a brand new HR44 in the water. We had the opportunity to spend a lot of time together (and have a lot of fun while navigating!). 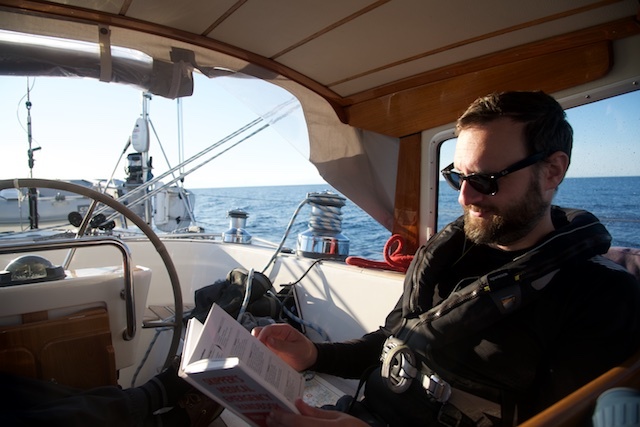 There is nothing more suited to deep and interesting conversations than being on a sailing boat with miles and miles to cover. And what interesting and profound conversations we had! It is difficult to describe what sentiments all of this left behind and I’m particularly bad at it. 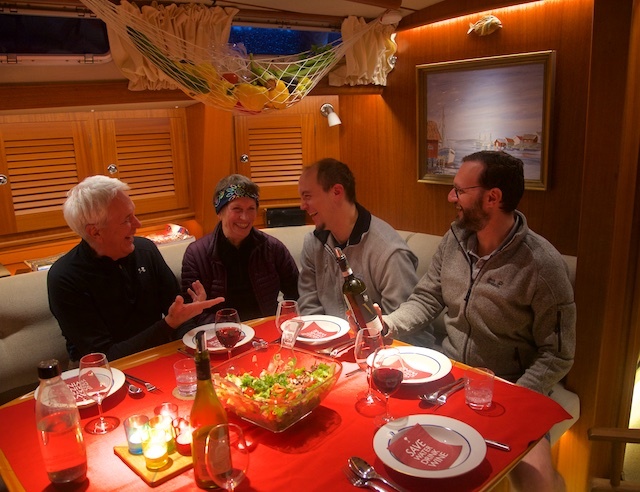 A cozy meal onboard while anchored in a sheltered bay in the Norwegian archipelago. 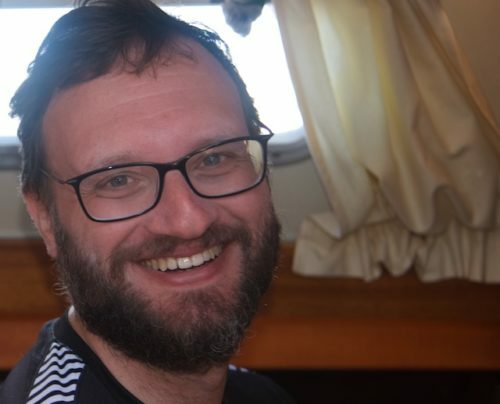 But I guess I can allow myself this one week away from all of that… the annual week on Regina Laska… the week of adventures and friendship… this single week of each year sailing on Regina Laska, makes the difference in my life…. It’s so fantastic! 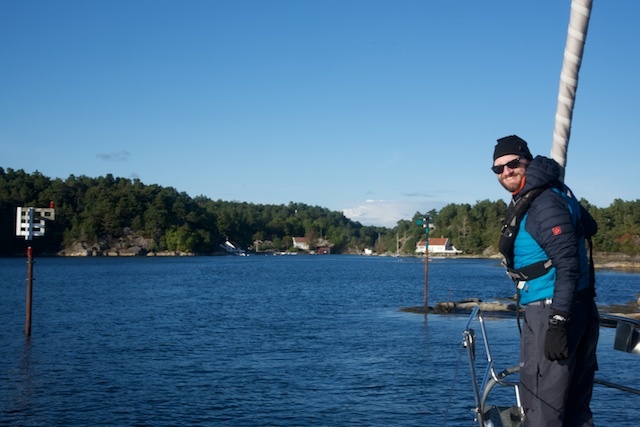 Lorenzo Murzilli, Italy/Switzerland, crossed the North Sea on Leg Leg 14-2017 from Inverness/Scotland to Vindön/Orust/Sweden.